This is my recipe for the popular Malaysian Stir-fry Kam Heong La La or Clams. I had posted the crabs version a few years back. So, I thought I should share the delicious clams version with you now. One of my readers wrote to me recently, lamented that she had used clams instead with the same recipe; but, it did not turned out quite the way she had expected. The whole dish turned out like clam shell soup! Well, don't get disheartened. In order to achieve the luscious spicy fragrant sauce for this dish, all you need to do is to quickly blanch the clams, shake and drain off all excess water before tossing them into the sauce. This method will prevent the sauce being too watery. That's all to it. 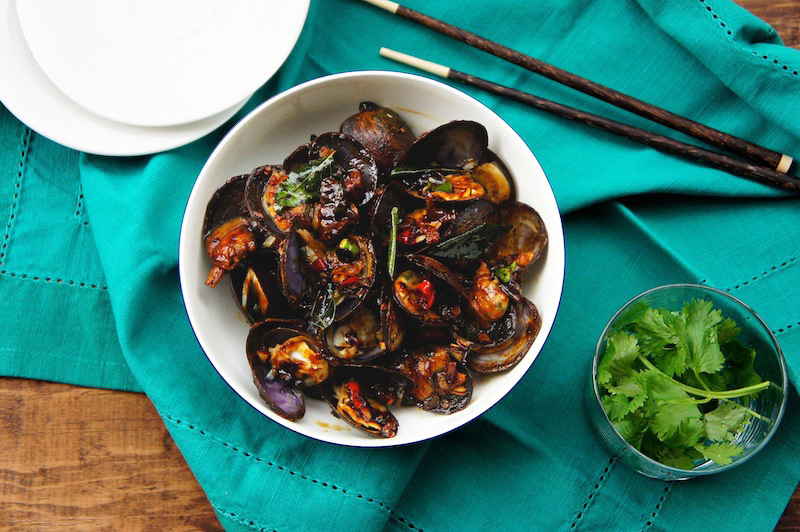 If you like spicy clams, then give this recipe a try. Scrub the clam shells, rinse thoroughly in cold water,and drain well. Add enough water into the wok and bring to a boil over high heat. Add in the clams and once the shells about to open, transfer to a large colander and shake off excess water. Rinse the wok, and reheat with the peanut oil on medium to high heat. Cook the dried shrimps until crisps. Then toss in the shallots, garlic, ginger, chili, curry leaves, curry powder and cook until the mixture is golden in color and fragrant. Then add the coarsely ground black peppers, dark soy sauce, and oyster sauce, sugar and give the mixture a quick stir. Mix in the clams and stir until well combine and season with salt if necessary. Serve immediately. Looks yummy! Can I use prawns instead of clams for this sauce? Thanks! Do you think it work with mussels? I'm sure it will work with mussels too.